Deaths, injuries and accidents at work: why are so many still happening? Despite significant advances in health and safety, accidents, injuries and deaths at work are still surprisingly commonplace. In this blog, North East personal injury specialist solicitors at Browell Smith & Co look at the continuing problem of accidents at work and whether more can – or should – be done to prevent them. Accidents and injuries at work are not only potentially traumatic experiences for the individuals involved: they are also costly and damaging to business, too. While we often focus on the tragic fatalities – and there were 144 of those in 2017/18 – it is also important to look at the injuries that do not result in death, but which could still have a huge impact on people’s lives. Even minor injuries can require a period of recovery time and damage quality of life. They can also lead to absenteeism, leading to a person being unable to do their job and lead to a loss of income and reduction in independence. How many workplace injuries are there in the UK? The Health and Safety Executive says there were 609,000 injuries of varying degrees reported by workers in 2016/7, while many more go unreported. 3 million working people suffering from a work-related illness. 2,595 mesothelioma deaths due to past asbestos exposures (2016). 144 workers killed at work (2017/18). 70,116 injuries to employees reported under RIDDOR. Who is affected by injuries at work? Firstly, the individuals are affected. Injuries can cause issues at work, prevent people from doing their jobs, and cause a loss of quality of life at home, too. Depending on the type and severity of the injury, recovery can take weeks or even months. If treatment isn’t sought, full recovery may never happen. The victim may become unable to take part in activities they enjoy. If they are forced to be absent from work for an extended period, they may lose earnings. Secondly, the businesses themselves lose out. Health and safety procedures might seem like a drain on time and resources, but the cost of injuries can run far higher: the Health and Safety Executive estimated the cost to businesses of injuries and ill health came to just under £15bn in 2015/6. It also claims that two million working days were lost over the same period. What are the most common causes of injuries at work? Injuries can be caused by a wide range of occurrences. Sometimes it’s human error or overconfidence: as we mentioned on our recent blog about falling from height, some responsibility remains with the individuals. Acting in a way that may injure yourself or others is never acceptable. However, often it’s a systematic error or failure to implement the correct industry-standard safety procedures – and it’s in these circumstances that a personal injury claim can be made. What protection are employers required to provide? Employers are subject to the Common Law and enshrined in many laws enacted by Parliament over the years, as well as following Directives of the EU. Consequently, employers have a duty to do all they reasonably can to prevent employees from suffering injuries or illness caused by negligence or breach of statutory duty within the workplace. 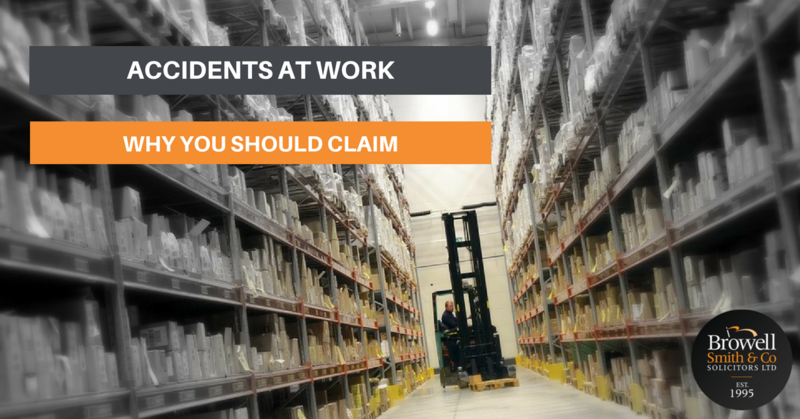 When an employer fails to do this, resulting in an injury that was not the employee’s fault, then the employee is entitled to bring a claim for damages against the employer and its insurer. The level of protection varies, naturally, according to the work environment and the nature of the job. Every company should carry out a risk assessment to identify areas of potential risk, what should be done to minimise those risks, and whether improvements to processes or safety equipment need to be provided. Someone working in a chemical plant or on a fishing trawler will naturally be exposed to more risks than someone who works in an office, but the duty of care on the employer remains the same and everybody has the same right to be protected. Why should I take legal action? It’s important that we achieve the compensation deserved and put you back in the position you were in before your accident. We’ve talked before about people’s rights to be compensated and it is a core ideal at the heart of the British justice system. It is also important that lessons are learned – if accidents go unreported, and if companies go unpunished for exposing their staff to unnecessary risk, then improvements won’t be made, and there is the chance it could happen again to someone else in the future. Can you take action against an employer and keep your job? Taking legal action against your current employer may feel like an awkward situation to put yourself into. You should bear in mind that the claim will be taken against the company’s insurers. As a valued employee, it will be in your employer’s interests to get you back feeling and performing at 100%. We deal with a lot of people who have made successful claims and remained at their employer – if you have any questions about doing this, we would be happy to talk it through with you. Contact our expert team today to arrange a no-obligation chat at any of our offices, in Newcastle, Cramlington, Ashington and Sunderland, or alternatively by 0800 107 3000, to discuss your particular requirements.